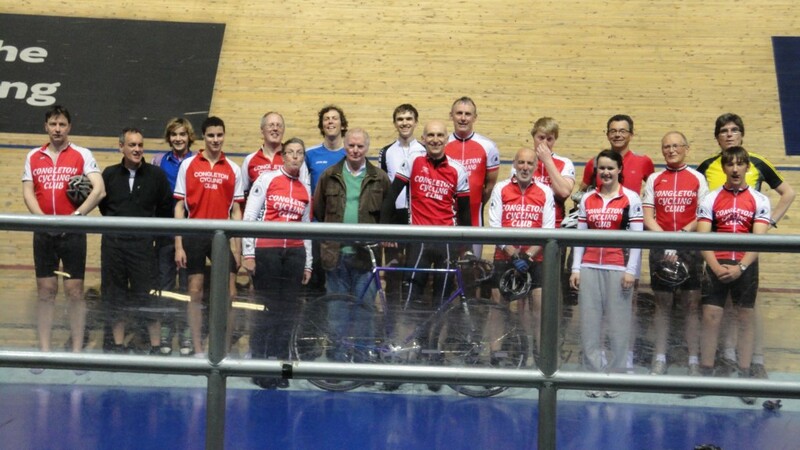 23 Club members took part recently in a 2 hour session at the Manchester Velodrome. Charlie Evans was our chief coach for the evening and Denise Hurst acted as assistant coach. The riders were split into 2 fairly equal groups. The novice riders were taken through the basics of bike positioning, starting and stopping (easier said than done on a fixed-wheel bike! ), and safely riding on the banking. By the end of the session all were riding confidently on the blue line. The more experienced riders concentrated on improving their group riding and bike handling skills. Some speed exercises were also given that proved more strenuous but still much enjoyed. All riders thoroughly the evening, with many asking the organiser Tony Elliott when the next one would be! Photo Caption: Left-to-right: Stephen Kane, Paul Kennington, Alistair Kennington, Tristan Roberts, Dean Roberts, Denise Hurst (Assistant Coach), Charlie Evans (Chief Coach), Edgar Reynolds, Mike Line, Tony Elliott (Organiser), Wayne Powell, David Hurst, Joe Langford, Beth Eardley, Stephen Jackson, Bob Norton, Rowland Bainbridge, Mark Allen. Rob Waghorn reports: “Last Sunday I rode the New Forest Excursion 200K which criss-crossed the New Forest from Lymington. It was a very scenic ride through many New Forest tourist towns with lots of animals wandering around freely. Unfortunately the weather could have been kinder, a stiff wind was present all day and at times it made life very challenging while riding directly into it for over 2 miles across open moorland. Also in the afternoon the skies opened and some showers did their best to dampen all the riders’ feelings. However, despite the weather it was a good day out and I met up with some Audax friends too. On a wet and cold evening, 27 riders competed in the club’s 10 mile TT on the Macclesfield road. There were 19 Congleton CC members and 8 visitors, including 5 from Leek CC who were using the event as their club 10 mile championship. The fastest rider was our own Pete Smith in 23.21. Results: Pete Smith, 23:21; Pete Tatton, 24:24; Wayne Powell 24:42; Stephen Jackson, 25:10; Mike Jones, 25:52; Ben Norbury, 26:09; Mike Line, 26:22; Duncan Poole, 26:28; Paul Dentith, 26:37; Paul Turner, 26:53; Ed Wright, 26:55; Chris Goodwin, 27:15; Tony Elliott, 28:12; Joseph Langford, 29:32; Helen Evans, 29:59; Sam French, 30:40; Mark Allen, 31:29; Beth Eardley, 32:49; David Hurst, 34:42. Helpers were: Course Safety signs Rob Waghorn/Avril Waghorn; Signing on Bob Norton/ Roy Hayhurst; Start Timekeeper Rob Waghorn; Pusher Off Kelvin Milward; Marshals at Grove Denise Hurst/Peter Hayhurst; Marshal at finish Rob Langford (non member); Finish Timekeeper Bob Norton/Roy Hayhurst; Finish Scribe Phil Allen (non member); Refreshments Avril Waghorn/Rob Waghorn.